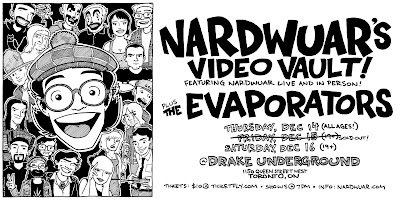 Nardwuar The Human Serviette News: Nardwuar's Video Vault & The Evaporators in Toronto: Dec 2017 ! 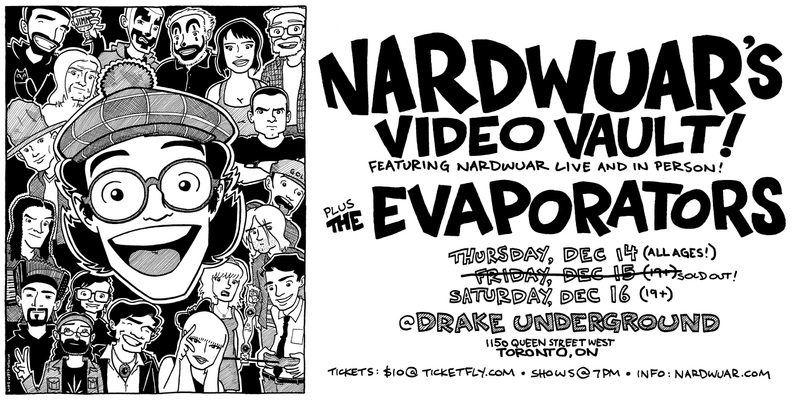 Nardwuar's Video Vault & The Evaporators in Toronto: Dec 2017 ! We are doing this again in 2017, except in Toronto! 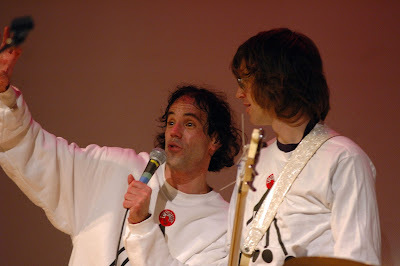 Chris Murphy of Sloan Music joined my band The Evaporators playing bass for a show we did and Video Vault in 2006 ! On December 14 2017 and December 16 2017 ( December 15 2017 is SOLD OUT!) at the Drake Underground in Toronto (1150 Queen Street West) I am doing 3 shows (1 All Ages and two 19+) with Chris again and I will be doing a Video Vault ! Tix are $10. Facebook Event page and tickets are here Nardwuar's Video Vault w The Evaporators (All Ages + Bar Shows) Doot doo !